Fancy a shot at screen-printing, or building the tallest tower from some old newspapers? As part of a collection of free, creative workshops heading to Dundee Science Festival next week, ‘Screen-Print a Scientist’ will introduce visitors to screen-printing with help from Dundee-based Italian painter and illustrator, Sofia Sita. The family-friendly workshop will also shine a light on the achievements of some Dundee scientists (or those working in science) through the years including Geoffrey Dutton, D’Arcy Thompson and Margaret Fairlie. The event (suitable for those over the age of six) will take place from 6-8pm on Tuesday 1 November in MAXwell Centre, St Salvadors Street, Dundee, DD3 7EW. Alternatively, families can have ‘Fun with STIXX’! 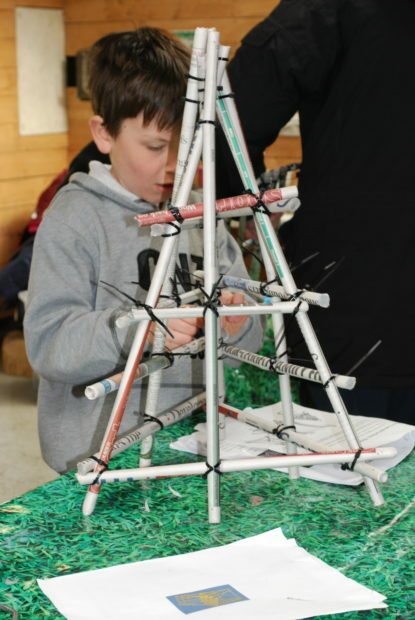 With the help of the STIXX rolling machine, which transforms old newspapers into robust sticks, visitors can design, sculpt and build their own creation or take part in a STIXX challenge to build the tallest tower! The event, which is suitable for all ages, takes place from 6-8pm on Wednesday 2 November at Menzieshill Community Centre, Orleans Place, Dundee, DD2 4BH. With many Dundee Science Festival events already fully booked, early booking is essential. Spaces are limited for both events – to book, please call (01382) 228800, email festivals@dundeesciencecentre.org.uk or book via www.dundeesciencefestival.org.